Bollywood electro-music festival, Bollyboom, is all set to rock the city of Mumbai on 19 August 2017 at the NSCI - Dome, Worli. Headlining this edition of Bollyboom is the popular rapper RAFTAAR, whose song "Swag Mera Desi" won the Best Urban Song award at the Britasia Music Awards in 2014. Sub-Headliners include the ever popular DJ Aqeel, DJ Shilpi Sharma, DJ Amann Beyond and DJ Zulfi Syed. Bollyboom NSCI Night will commence at 7:00 pm on Saturday, 19 August 2017 and feature seven hours of non-stop dance music showcasing the best artists, aerialists, dancers, percussionists, liquid drums, special acts and more. With a larger than life décor, pyrotechnics and SFX, the event promises to offer a thrilling high octane, high BPM experience for visitors. Bollyboom will also offer a curated F&B experience for all attendees within a premium venue to enable party goers to enjoy a thrilling premium Bollywood Dance Music experience. Dilin Nair, a rapper better known by his stage name Raftaar, stylised RAFTAAR. He was formerly a member of the urban music group Mafia Mundeer, formed by Yo Yo Honey Singh. Raftaar's song "Swag Mera Desi" won Best Urban Song at the Britasia Music Awards in 2014. He is well known for his support towards the Indian underground hip hop scene. Currently he is working on his debut album Zero To Infinity. His first single from the album, "Baby Marvake Manegi", released and went viral upon release. DJ Aqeel, aka Aqeel Ali, has been rocking the dance floors across the globe for more than a decade. His passion for music gave him the motivation to defy convention and pursue music more than just a passing hobby. Known as the ‘DON’ or the ‘DADDY’ of remixes, DJ Aqeel is among the first few to pioneer Bollywood remixes and dance music in India. He significantly changed the way Bollywood music and dance music saw each other. His works have won him fans and admirers all over the world. A Bollywood actress and now dominating the Indian Music Scene with several chart topping official Bollywood remixes to her credit. He is the former Resident DJ of ‘Tote on the Turf’ and the IPL Sahara Pune Warrior cricket team. Now, he is a globetrotting DJ who performs across Dubai, Singapore, Kuwait and many more locations, therein creating a truly global fan base. As an Actor Zulfi has worked with top directors in Bollywood movies like Payasa, Chupke Se, Jimmy, Lara, Mr Hot Mr Cool, and worked in the mega budget movie Tajmahal as Prince Shahjahan . He has worked in Major Ad Campaigns like Raymonds, Tata Indica Car, Roopam Designers, Wall’s Ice Cream, Euro Inner Wear, Levi’s, Taj Group of Hotels, Fiesta, Rohit & Rahul Gandhi. Bollyboom is an existing Intellectual property, which belongs to Percept Live, forerunner that introduced a new genre called Bollywood Dance Music, a fusion of Bollywood music and electronic sounds in the festival market in India in 2013. ‘Bollyboom’, is known to provide a unique live entertainment experience for Bollywood music fans and is seen in different variants across the country. 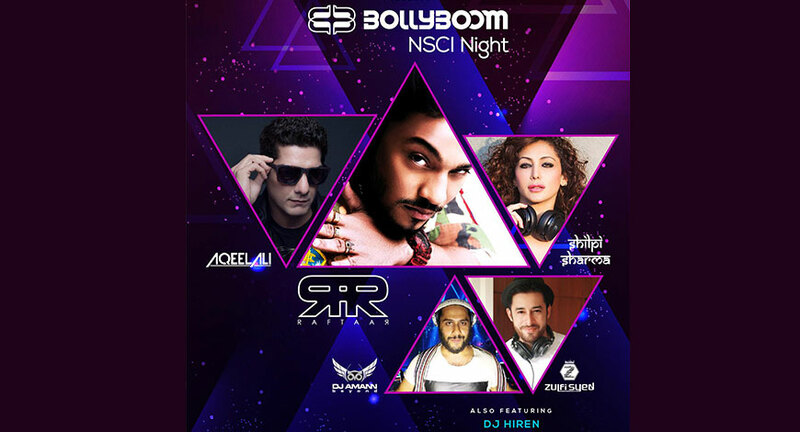 Bollyboom has hosted a couple of pop up party offering customers a unique fresh and an exclusive nightclub experience, along with an exclusive guest list and an unforgettable experience at Marriot in Mumbai.